- Mr. Fonseca, everyone understands that this is a special Portuguese club for you. What do you feel before the game? And what does the period you spent at Braga mean to you? - Of course, for me it will be quite special match. I'm meeting with my former team which I have recently left. Of course, it will be nice to see the people I’ve worked for a long period of time with. I have many friends there. Nevertheless, we shouldn’t forget that they are our opponents today. We should put aside all the emotions. I think the game will reveal everything tomorrow. After that, I will be able to have a word with my former colleagues. - During your coaching career, you played 11 games against the clubs you had used to work with, winning seven of them. What is the secret behind that kind of performance? - To be honest, it's hard to explain. I'm not the man who thinks about the past at such moments. I do not think it can influence tomorrow's match in any way. Naturally, I hope that this trend will continue tomorrow and we will win. Once again I want to beat my former team. - You encountered Jose Peseiro four times, and in all those games you got the upper hand, although he is a more experienced coach. Perhaps, you’ve got some secret in this respect? 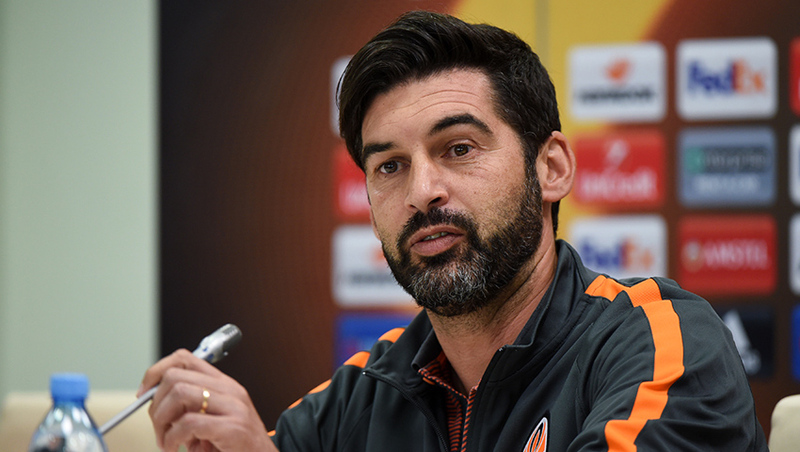 - First of all, it’s Shakhtar and Braga meeting tomorrow and not Paulo Fonseca and Jose Peseiro. I want to repeat it: I do not think that the past can influence our next game in any way. But I hope that this trend will continue and tomorrow we will win for the fifth time. - Is it fair to say that Braga are the team who feel more comfortable operating on the counter? - Yes, I think just so. I had the opportunity to watch their most recent away match against Benfica. The game showed that they are very strong on the counter. I think the scenario will not change tomorrow. Taking our style into account, we are likely to see Braga launching some blistering counterattacks. They have strong and fast players in the attacking third. - How different is the current Braga from the one you used to coach? - Every time it's natural when the new coach joins the team and brings some new ideas, his own views of the game. That’s the main difference. We cannot speak in detail at the moment, I mean the particulars. It’s just a different kind of football. - How is Yaroslav Rakitskyy? How serious is his injury? When he gets back? - We tried really hard to get Rakitskyy available for tomorrow's match. We didn’t succeed yet, so we decided not to risk it. In a few days’ time, we are facing an encounter with Zorya, after which we’ll enjoy a short break. Hopefully, during this time Yaroslav will recover and help the team. - He won’t play against Zorya as well? - We will see. Probably not. - Do you remember any weaknesses of Braga that you can take advantage of? - On the one hand, it is necessary to take into consideration that the new coach has come and changed the style of play. It is different from the one when I worked. On the other hand, I can’t say that Braga have any flaws or weaknesses. Frankly speaking, our preparation is not based on some weaknesses of the opponents. We try to display our game, playing in the same way against all the teams, stick to the style practised by Shakhtar. We did not study and will not put pressure on the weak spots of Braga. - Does the presence of Darijo Srna in Shakhtar delegation mean that he is ready to appear tomorrow? - I do not know if he will play. You need to wait until tomorrow and see. But the fact that he came here with us, implies that Darijo has recovered and is available.